At the recent PEVoC6 conference in London, delegates were wowed by the Kentwood Show Choir’s spot in the Great Hall of St Barts (in fact, certain distinguished delegates were seen humming and bopping…). 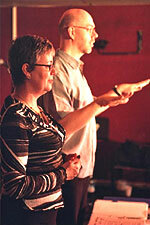 Sheila Harrod, Kentwood’s director, has been working with Gillyanne since 1998, and has implemented a number of Singing and the Actor techniques in the choir’s vocal training. Gillyanne returned to Swindon recently to give the choir a top-up session. Click here for a detailed account of her day. The Vocal Process visit to Tel Aviv at the end of July began with a small flurry of activity at the airport due to the presence of Ed, our half-head anatomical model. Having successfully negotiated airport security, Gillyanne and Jeremy began with a day in the voice clinic, filming their vocal folds in different voice qualities and onsets. Many thanks to our laryngologist friend Moshe Harrell and to his colleague Ari Hoffman, whose company DCS Medical Ltd provided the equipment for scoping. Look out for excerpts on the video coming soon to the website. For the first day of courses for the Stage-Center organisation, we moved to the Performing Arts Centre, home of the New Israeli Opera. The first course, for amateur singers, began with a detailed warm-up incorporating some of the vocal techniques to be used during the day. We discussed the search for vocal identity and for emotional connection – universally accepted goals – and worked with the group on where a voice is made and how it works. We also introduced different sounds and voice qualities using group exercises and individual coaching. The second course, a three-day training on Musical Theatre skills, was attended by 35 professional singers, actors and singing teachers. We began with an unannounced audition session – your best 16 bars to be sung in front of the group. This exercise shows how singers react under pressure, and helps identify the problems that need attention. With all the participants eager for personal attention, we divided the group into two and spent the remaining time coaching individuals under glass and creating small-group exercises. Gillyanne introduced the participants to creating different voice qualities under the title of ‘vocal generics’ and brainstormed some problems of technique experienced by the group. Jeremy then explored this work further, finding characterisation using different voice qualities, discovering the song landscape, and identifying the song journey. “I have discovered how specific you need to be about voice, mood style and character.” “Small and accurate is strong!” “I have gained things that can help me through difficult times”. On the final day, Gillyanne and Jeremy were invited, along with Theatre de Complicité founder member Jos Houben (creator of The Art of Laughter course) to give a lecture presentation on their work at the Givataim Theatre. The audience of 300 included representatives of the European Union and the British Council (who had part-sponsored our visit). Our thanks to all the participants for their enthusiasm and sustained focus and generosity of spirit. We hope to return soon. 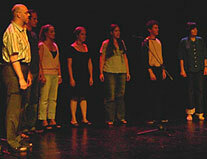 The MA Voice Studies course at CSSD includes a regular module created by Gillyanne for these trainee voice teachers. The students come from a range of backgrounds, including professional story telling, classical and musical theatre singing and various branches of theatre. This year’s course consisted of 2 full day workshops 10 days apart. The aim of the first workshop was to give a practical introduction to the four vocal sets – Speech, Falsetto, Cry and Twang. (Click here* for examples of different voice qualities). This generated much discussion of habitual vocal patterns that are encountered in different social environments and in different vocal genre. Although the MAVS students are well-versed in anatomy and physiology, the day provided a chance to recap on certain elements of vocal function as the vocal sets were deconstructed into their components. Small group work on the vocal sets helped to develop personal accuracy as well as auditory skills that will be useful in the future in their teaching. For the second day, the students were asked to identify challenges they meet during their teaching practice and bring them to the workshop. Teachers often feel that they are isolated from each other and that they need to know all the answers. This is felt all the more keenly by new teachers. Using this format, an arena for discussion and exploration was created. The students left with an increased understanding of the possible causes of vocal difficulties and felt that their own diagnostic skills had improved as a result. * Links will take you to our resources section pages which contain spectrograph illustrations and downloadable sound file demonstrations. 25 people attended the Voice SIG day held at the Princess Elizabeth Hospital, Exeter, with Gillyanne Kayes and Jeremy Fisher. The SIG were all Estill or Voicecraft experienced and had requested developmental work on vocal sets and specified vocal figures. As well as improving their own vocal skills, the group wanted ideas for application in clinical practice: for working with singers, for general voice use, for functional voice problems and possible pathologies. Physiology was reviewed where necessary and the group were able to revisit and practise new vocal skills relevant to their topics in small groups with Gillyanne and Jeremy giving input. Using the ‘Wasp’ and Multi-Speech™ voice analysis programmes, Jeremy Fisher demonstrated what to look out for on screen in a number of vocal set-ups such as modal to falsetto voice, pressed phonation and twang. Following the course, all participants were sent a completed copy of the ‘Application of Vocal Sets’ chart and a template of Jeremy Fisher’s movable larynx which had proved very popular on course! A group of 10 teachers attended the full day INSET with Gillyanne Kayes. The teachers were working at Key Stages 1-4 and 16-19. Additionally some were giving one-to-one singing lessons, preparing pupils for exams, while others were running choral groups. The teachers had requested some ‘science with direction’; help on dealing with range and registers; learning about voice qualities for different music genres; tips for classroom and rehearsal; vocal health and a case history brain-storm. The day began with a list of burning questions that Gillyanne elicited from the group. Categorised under simple headings, the list was an excellent jumping off point for the ‘science with direction’ section of the INSET. Throughout the day, as new topics were discussed and new techniques learned, the list became a key point of reference. The day concluded with a fun session on four vocal sets – Speech, Falsetto, Cry and Twang, with discussion about application in different genres. 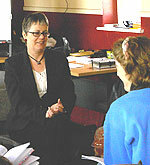 The course was supported by handouts, and the teachers were encouraged to keep talking and listening together. 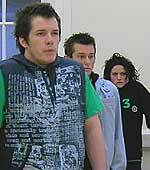 Motherwell College, Singing and the Actor training. The Performing Arts department of Motherwell College wanted their students to have input on their vocal performance during their second year of training. The college has a social inclusion programme, so one of the challenges was to work with a very diverse range of abilities. Over four visits Gillyanne was able to work with the students in an informal master-class setting. This enabled her to talk generally to the group about performance values, style and interpretation and to give specific technical input to each student. With the course vocal tutors attending whenever possible, this series of visits enabled the students to increase their understanding and vocal skills, and the department itself to develop creatively. Gillyanne Kayes returns each year to LIPA to give the BA Acting students a foundation course in vocal production. The main focus of the course was to enable the students to understand that ‘good voices’ can be developed and that everybody can sing. The students took a lively interest in the mechanics of voice, and enjoyed the video-endoscopic footage of the larynx. This course was taught in a group format, enabling students to listen to each other and observe each others’ progress. The culmination of the course was in a mini master-class on the final day, with each student singing a short song or song extract a cappella for the group, with guidance from Gillyanne. ‘ESMUC’ has a regular Singing and the Actor course taught by Gillyanne Kayes for its department of Jazz and Contemporary Music. Performers from outside the school can also attend by invitation, and range from heavy rock singers to Flamenco and classical artists. 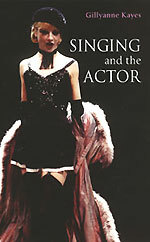 The November course focused on the mixed vocal sets described in the second edition of Gillyanne Kayes’ Singing and the Actor, including Belting and its variants. The format was part presentation and part group practical work, with translation provided by ESMUC course tutors. The course ran for 12 hours over three days, allowing ample time for questions and feedback. Each day concluded with a performance masterclass. This course was set up to develop the MA Performance in Musical Theatre that began in September 2003. It was an opportunity for staff to find out more about what is currently expected of Musical Theatre singers and how to help prepare them in vocal training. The requirements for Belting were of particular interest and concern. The afternoon session, chaired by Head of Vocal Studies Christopher Underwood, enabled singing tutors to discuss and compare different approaches in teaching practice. The day proved helpful in building a strong interface between the staff of two different departments at the Academy. 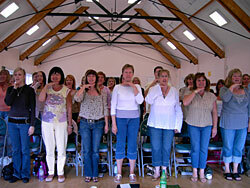 The London Studio Centre requested a day’s in-training for their vocal team. Gillyanne Kayes and Jeremy Fisher created a course that enabled the staff to discuss the challenges faced by their students and to explore a common language for dealing with them. There was a short presentation on fundamentals of anatomy and physiology with video footage of the vocal folds in different vocal sets. Techniques for dealing with specific problems. Deirdre Trundle presented an interactive workshop to teachers London-wide as part of Essex County Music Services ‘Singing in the Classroom’ event. For the morning session Deirdre led the group through her ‘fast track’ warm-up, an accessible, fun and effective routine. Many teachers are now employing the routine in the classroom. It has the additional benefit of warming up the teacher’s voice at the same time, making for healthy voice use throughout the day. During the afternoon sessions Deirdre presented an interactive workshop on the challenges of adolescent voices in change. Teachers report that young singers tend to drop out of choral and other singing events during these years. Using Deirdre’s information and techniques, both boys and girls can keep singing throughout the challenging period of adolescent change. More than 20 teachers attended the session, which was led by Gillyanne Kayes and Jeremy Fisher. The aim of the evening was to introduce the group to the concept of Belting, to establish some of the techniques, and to generate discussion. The teachers’ concerns included vocal health, suitability of repertoire for young people and the place of belting as part of a programme of vocal development. The session began with audio examples of both male and female singers belting, and included children singing in a gospel chorus. – Range, repertoire, do’s and don’ts. The evening finished with Gillyanne leading the group through a vocal warm-up appropriate to belting.